If you follow this blog, you know we take any chance we get to leave Dubai and Tbilisi has always been on our list. 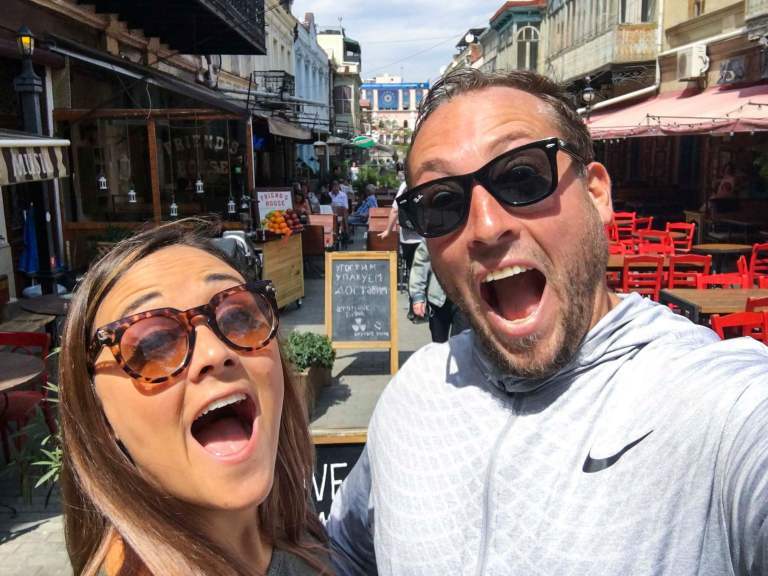 We were finally able to escape the sandpit for 48 Hours in Tbilisi, Georgia and cannot get over how much we loved it. Under Russian control from 1801 to 1917, Georgia holds an incredibly eclectic mix of Soviet-era architecture with quaint European feeling cobblestone streets and outdoors cafes mixed with almost a Mediterranean vibe with lush greenery and some of the best wine in Europe, a quite magical mix. On top of all this, the Georgian's have their own alphabet, beautifully intricate and unique, adding to the allure of this often skipped over country. Only a three and a half hour flight from Dubai, 48 Hours in Tbilisi, Georgia can easily be done in a standard weekend with flights arriving at 5 am Friday morning and leaving at midnight Saturday night - you have no excuse! There is no greater feeling than arriving in a city and country you know nothing about and just heading out on foot to see what there is to discover, and that is exactly what we did. We parked ourselves at the beautiful Radisson Blu Iveria, right in the middle of the city, 15 minutes from the airport and walking distance of pretty much the whole city, which snakes its way along the banks of the calm Kura River. Make sure to take advantage of the Super Breakfast, it'll keep you filled for hours as you explore the city. We use this secret at every Radisson Blu we stay at around the world to save us money. Best hotel breakfast in the business. Heading down the main drag in Tbilisi, Rustaveli Avenue, we got so excited seeing all the shops filled with Georgian sweets, hand made gifts, and of course Georgian wines - some of the best in the world. Walking through Freedom Square, we simply picked a cobblestone street to go down and got lost, our best decision of the day. Tbilisi is a small city and one you will become familiar with very quickly the more you walk around. Yes, the stores and locals cater to tourists, but it never felt aggressive or annoying as we strolled along the cute side streets and up the hills into the neighborhood. Once we made it down to the main town square, we saw cable cars going up from the banks of the river to the Narikala Fortress and had to give it a try. Extremely cheap, about 5 dirhams, you get a round-trip ticket up and back to the fortress, but take our advice and walk the winding streets back down once you make it to the top. The view from the fortress is the best of the city and if you're spending 48 hours in Tbilisi, Georgia this is not to be missed. The Kartlis Deda, or lady of Tbilisi, stands atop Sololaki next to the fort and is quite impressive. As you make your way down the hill, you'll be tempted to walk into every single little outdoor cafe or bar, and we don't blame you for stopping. However, if you want to find what we think is the cutest little street in Tbilisi, wander through the city to King Erekle II Street, full of back to back to back outdoor cafes offering the best in Georgian wine and cuisine - we spent far too much time sitting outside at nearly every one of these restaurants. There are artists selling wares along the sidewalks, often musicians passing by and always a great group of tourists and locals alike enjoying the beautiful weather and sunshine. Now, if you've made it this far, no 48 Hours in Tbilisi, Georgia is complete without completely gorging yourself on cheese, and lucky for you, the Georgian national dish, Khachapuri, is just for you. Made from a slightly sour cheese, this bread boat of sweet, sweet cheese death is filled to the top with cheese, stuffed with cheese and then they add an egg to the top just to push you over the edge. I think we ate five in a weekend, and we don't care what you think. Once the sun has gone down, there is no end to the fun and unique nightlife spots in Tbilisi either. The Hangar is a personal favorite among expats, Vino Underground needs to further explanation and Warszawa is literally a fast food style bar. Walk in, get a shot from a vending machine, and walk out. If you're keen for enjoying a cocktail with a view, the OxygenBar at the Radisson Blu is going to give you the best view, and if you're like Anne and I, a place to enjoy a cocktail AND do a little work. Don't go out too hard, because there is still a lot to explore in Tbilisi! Make sure to head down to the Dry Bridge Market. Located in the park right along the banks of the river, this funky street market might have been our favorite and least expected find during our 48 Hours in Tbilisi, Georgia. From very strange and unique art pieces and statues to straight up old Soviet-era uniforms, currency, and weapons, this eclectic market truly has something for everyone and is a fascinating glimpse into the past of the country. Now, maybe you've got more than 48 Hours in Tbilisi, Georgia and you want to go further out of the city and explore some of the beautiful rivers, mountains and countryside, fear not! There are endless local tour companies and guys on the street offering tours just about anywhere you can think of and featuring anything from day long vineyard wine tours to extreme climbing and rafting - the opportunities are endless. As far as transportation in Georgia, the taxis are actually quite cheap and most know everywhere in the city. Always good to carry the business card of the hotel you are staying at which always comes in handy. On top of the city being very small and walkable, there is a very modern and extensive underground metro system as well, which is cheap. All in all this was easily one of our favorite 48 hour trips from Dubai, and we've done a ton of them. When you escape from Dubai you're looking for something different, something new and something exciting. Spending 48 hours in Tbilisi, Georgia is an amazing way to spend a weekend, and is so close to Dubai. With all the greenery, adorable city center, outdoor cafes, cheese and wine you really cannot go wrong.